HTC is rumored to be working on a cheaper version of the HTC One M8. Known as the M8 Ace, the phone will be another spin-off of HTC’s flagship Android phone, but unlike the One Mini 2, it won’t have a smaller screen. Instead, the cost savings could come from HTC using a plastic body shell. Leaks have been showing up online for a few weeks, so a launch may not be far away. Here’s what we think we know so far. What will the HTC M8 Ace look like? A picture which may show the HTC M8 Ace leaked in mid-May. Resplendent in bright red, the phone looks like a One M8, but wrapped in plastic rather than aluminum. 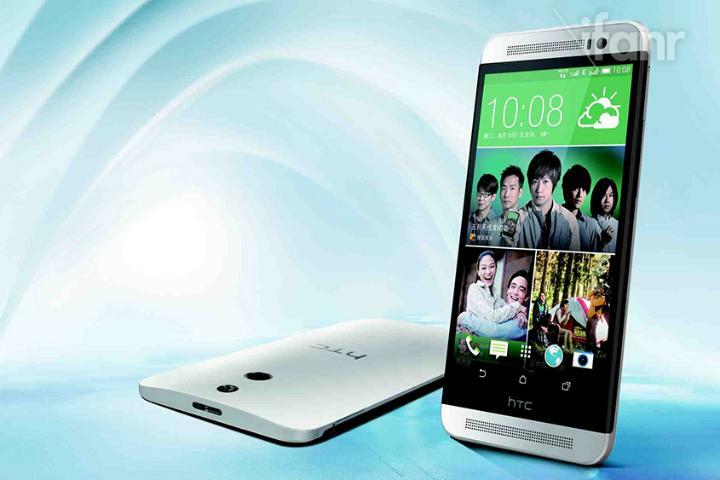 The sleek, curvy lines could tie the M8 Ace into HTC’s recent tease about such as device being almost ready for launch. The leaked picture, which first appeared on a Chinese news site, shows HTC is unlikely to fit the new Duo Camera to the M8 Ace. Above the camera lens is an LED flash rather than the Duo Camera’s second sensor. The recently announced One Mini 2 also shunned the Duo Camera, and the M8 Ace may end up featuring the 13-megapixel camera which replaced it too. Less than a week later, a second image of the phone was leaked, this time showing the front and the rear of the device. This shows HTC will still fit the stereo BoomSound speakers to the M8 Ace, and although the rear view looks like it’ll have the Duo Camera, the top sensor is probably going to be the camera’s LED flash. This time, the M8 Ace is shown in silver, suggesting it’ll be sold in multiple colors. This isn’t the first time we’ve heard about the M8 Ace. At the end of April, a rumor report indicated it would be a plastic version of the range-topping M8, while another stated the M8 Ace would have a similar spec list to the Galaxy S5, but the eventual price would undercut Samsung’s flagship phone. Apparently, the phone will have a 5-inch touchscreen with a 1080p resolution, and feature a quad-core Snapdragon 801 processor. This not only matches the Galaxy S5, but also the One M8, and just about every other high-end Android smartphone on the market. The leak which provided the second picture of the M8 Ace also shared some possible features. In addition to the 5-inch, 1080p screen and Snapdragon 801 processor, we should get a 13-megapixel camera, a 5-megapixel front camera, 2GB of RAM, a 2600mAh battery, and either 16GB or 32GB of internal storage. Support for HTC’s new flip cover introduced with the One M8 will be included, along with Android 4.4 and Sense 6. It’s estimated the M8 Ace will cost the equivalent of $480, undercutting the One M8 and other high-end phones. The report closes with news HTC may launch the phone on June 3, but it only mentions China. This could mean HTC won’t be selling the M8 Ace outside of Asia, preferring not to take attention away from the higher priced One M8. We’re expecting to see the first wave of 1440p resolution smartphones, powered by Snapdragon 805 chips, arrive during the second half of this year. Due to the inevitably high costs, this could make keenly priced devices like the M8 Ace more desirable. There’s no official launch information available at the moment, but if HTC was describing the M8 Ace in its “curvy” tweet, then it may not be long until it’s officially revealed.